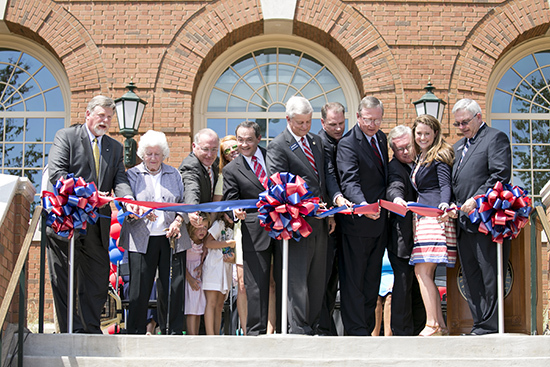 Samford University officially dedicated Cooney Hall, new home of the Brock School of Business, in a Sept. 4 ceremony. Earlier in the day, Samford’s board of trustees had approved naming the building for Samford alumnus and Birmingham business executive Gary Cooney. Cooney, vice chairman of McGriff, Seibels and Williams Inc., a member of the Samford Board of Overseers and a 1974 Samford graduate, pledged $12.5 million as the lead gift for the building. Cooney said his family “was blessed to participate with Samford.” He added that the building dedication is not about the financial gifts that made it possible, but rather is about the man who had the vision, referring to Harry B. Brock Jr., the late banking executive for whom the business school is named. In December 2007, Samford’s School of Business was renamed the Brock School of Business for Birmingham banking legend Harry B. Brock Jr. Today, what is being hailed by university officials as the “next generation building” for students and business education was dedicated, fulfilling Brock’s vision of a state-of-the-art structure for business education. The $25 million four-story structure features a breathtaking glass atrium in the middle of the building that looks down three floors to an imposing lobby. Emblazoned on the floor of the lobby is the Samford University seal. Surrounding the lobby are donor walls listing the many people who made the building possible. The building houses a new state-of-the-art portfolio management room with six Bloomberg terminals that enable students to have access to comprehensive research capabilities and financial data worldwide. Students using the room will be able to present their analysis to classmates and industry leaders in a Wall Street-type setting. The ticker outside the portfolio room can be programmed to rotate updated NASDAQ or NYSE data 24 hours a day. The Student Incubator is designed to offer an atmosphere for students in the entrepreneurship program who want to launch a new business. The area is supported by technology, administration and faculty and will allow student start-ups to minimize costs and overhead in starting their new businesses. The technology located throughout the building allows students and professors to learn at the highest technological level possible. Microsoft and Apple software and hardware are available throughout the building in classrooms and computer labs. There are cameras for filming lectures and providing streaming capabilities for executives speaking on campus as well as for posting on social media platforms and websites. In addition, in the Student Commons area, the furniture is equipped with data ports for students to learn in a relaxed setting. “The real impact of this state-of-art building is that it provides an exciting learning and meeting environment that will foster outstanding opportunities for our business students to learn in a professional environment for generations to come,” said Howard Finch, dean of the Brock School of Business. The layout of the new Brock business building is intentional across all four floors. The first floor contains four 40-seat classrooms and two 16-seat seminar rooms to be used as instructional space. The second floor combines more classrooms with a number of student-oriented amenities, including a student commons area, breakout rooms for group and project work, and the Academic Programs suite housing curriculum advisers and the internship director. The third floor contains exceptional office space for the entire faculty of the school and outstanding conference rooms for committee and group meetings. Finally, the fourth floor has two 40-station computer labs and a community resource room designed for large-scale events. One of the highlights of the new building is the Regions Community Resource Room that provides much needed event space on campus. It has a room large enough to hold more than 350 people in a theater-style event setting or 200 people for dinners and receptions. It has three different audio-visual projection systems and sound systems that can be used for conferences and meetings. The room also is supported by an enhanced catering kitchen, which will allow events to take place simultaneously. The building, growth, maintenance and upkeep will be funded through an endowment fund where donors can support room and area sponsorships throughout the building.